Why is an Underarm Gusset Good? Here’s your 40 second visual rundown on just what an underarm gusset does in a simple smock/shift/chemise/shirt pattern. 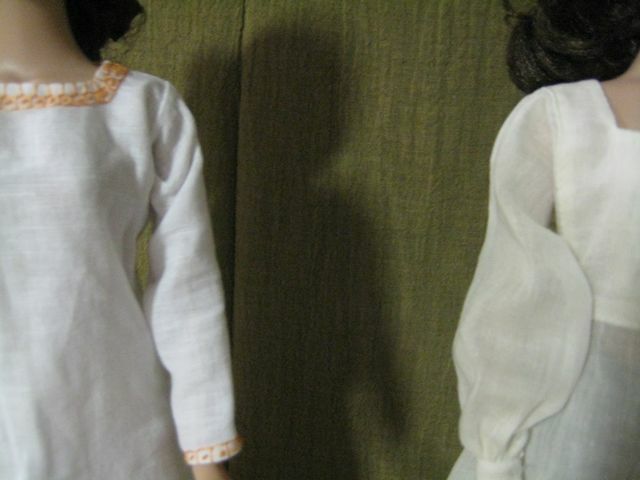 I have two very simple smocks here – one eleventh century style, a la Kohler, and the other more of a sixteenth century style, adapted from Arnold. There’s a drastic difference in the fit at the shoulder. The smock without the underarm gusset (left) has more fabric bulk at the shoulder. 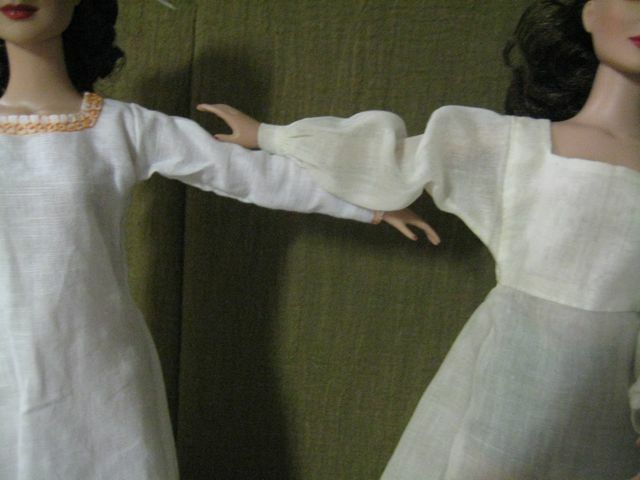 When you straighten out their little dolly arms, you can see what the gusset does. I love gussets. You can add a gusset to an existing garment (fabric matching might be difficult, but doable..sometimes) to give a little more ease to the arm. I hate dresses and blouses that raise up entirely when I raise my arms. When you draft your pattern you can add the gusset to the pattern; when adding in later it is more of a diamond shape whose width is dependent upon the amount of ease you require. Good point on the shape of gussets added after the fact, JL. The diamond shape is traditional even for gussets added during sewing. It’s easy to find a square of fabric, and then the bias of the fabric is running in the direction of reaching up or out – right where the stretch is required! your post makes me think of suit jackets – and how limiting they are when you need to raise your arms higher than chest height . So why don’t they add gussets to suit jackets to improve range of motion? I mean is there a downside to adding gussets since it seems like all positive reasons to add a gusset? Hi, Marisa – I couldn’t say for sure. I think they don’t do it because traditionally, if you’re in a well-fitted suit coat, you’re supposed to be important enough that you don’t really have to do manual labor. I think it’s more that a well fitted jacket has the undearm cut high enough so that you can raise your arm properly.